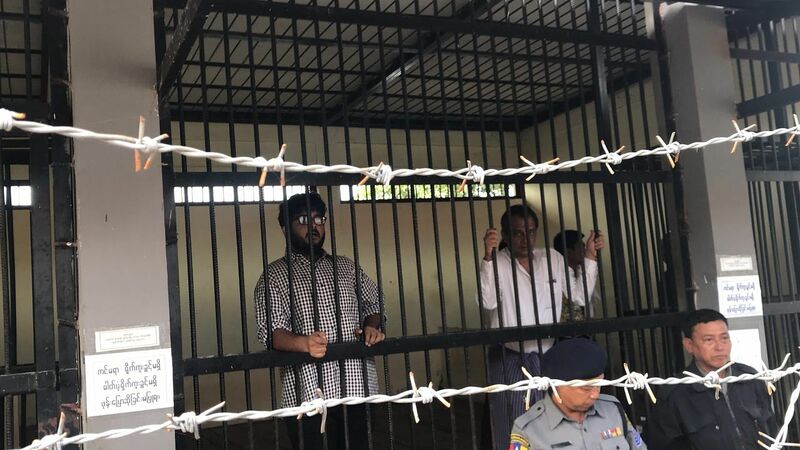 NAYPYITAW - Four people, including a Singaporean cameraman and a Malaysian producer, were sentenced to two months' jail each in Myanmar on Friday (Nov 10), after they pleaded guilty under the country's Aircraft Act. Singaporean Lau Hon Meng, 43, Malaysian Mok Choy Lin, 47, as well as their local interpreter Aung Naing Soe and driver Hla Tin, were detained on Oct 27 while the two journalists were on assignment for Turkish Radio and Television Corporation (TRT). They were accused of trying to use a drone to record video images of the Hluttaw, or House of Representatives building, in the Myanmar capital without permission. The four were also charged under the import and export law and the hearing will be held on Nov 16. They could be jailed for up to three years if convicted of this charge. Defence lawyer Khin Maung Zaw was cited by Reuters as saying he would appeal for a reduction in the sentence to a fine. The detainees admitted that they committed the crime hoping they would only be fined, so it shocked us when the judge sentenced them to two months," the lawyer said according to Reuters. Mok was awarded a scholarship by the then Singaporean Broadcasting Corporation to read English Literature at Cambridge University for her bachelor's degree. According to an article in The Star, she was later involved in producing, writing and directing shows like Under One Roof and Phua Chu Kang. Before proceedings began on Friday, Mok told reporters in the court that they were sorry for any disrespect of Myanmar’s laws, but criticised the legal process for lacking transparency. Interpreter Aung Naing Soe told reporters police had asked about whom the journalists had spoken to and about the trips he had made to several of Myanmar’s restive regions, including Rakhine where an ongoing conflict involving Myanmar troops and the Muslim Rohingya minority and the resulting humanitarian crisis have drawn international backlash against the Myanmar government. Drones occupy a legal grey area in Myanmar. While there is no specific law on drones, individual authorities have tried to restrict the use of drones on their premises. On the other hand, drones have also been used to gather meteorological data and conduct structural checks. TRT is Turkey's state broadcaster. According to an Oct 31 statement issued by TRT World, its English-language subsidiary, Lau and Mok had entered Myanmar on journalist visas on Oct 21. They were filming a documentary and had "shot in various locations with conventional cameras as well as with a drone, up until Oct 27". "The Myanmar Information Ministry was previously informed about all filming activities and the filming schedule," TRT World said. "According to information TRT World has gathered from local journalists who are in touch with Myanmar security officials and our team, our crew wanted to film the Parliament building in the capital with a drone after conducting an interview with a member of Parliament. They were detained by security officials before flying the drone." Mr Myint Kyaw, an information ministry official contacted by Reuters, said however that TRT World had only made a broad request to film in Yangon and Rakhine state, without mentioning the journalists' visit to Naypyitaw or use of a drone.